HP has a few power-ups planned for the holiday that are worth getting excited about. Specifically, its newest 14-inch Chromebook will be getting a fancy Tegra K1 chip, and the Envy X2 detachable is going to get a serious powerboost from Intel's Core M Broadwell. 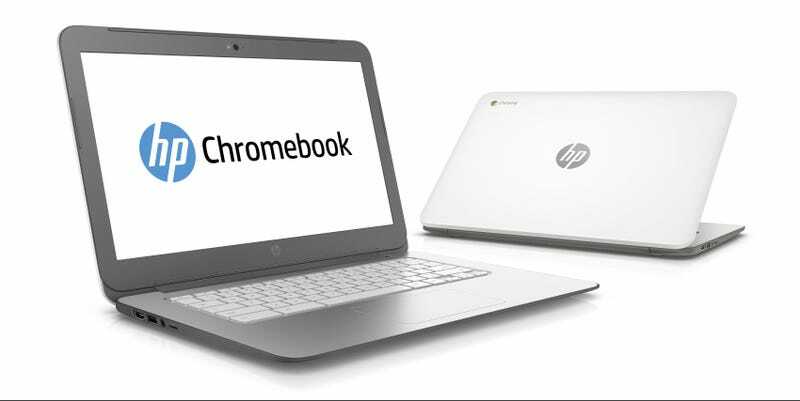 The new 14-inch HP Chromebook packing Tegra K1 inside boasts an impressive 9+ hour battery life according to HP, a bit longer than the what the 13.3-inch Acer Chromebook 13 that's repping the same guts can dish out in practice. HP isn't saying what the resolution of that big ol' screen is yet, but a lower resolution could explain the extra longevity. It would also explain the cheaptastic starting price of $300 for the base model. The new 14-incher is slated to hit stores on October 22nd of this year with four embarrassingly-named accent color options: Smoke Silver, Sorbet Orange, Ocean Turquoise, or Neon Green . Meanwhile, HP's new Envy X2 detachable will be repping Intel's new Core M Broadwell chips, which should give it a hell of a lot more horsepower than previous models' Atom processors. The full Windows 8.1 tablet-desktop hybrids will come with options of a 13.3-inch size and your choice of 1366 x 768 or 1080p resolution, or a 15.5-incher (resolution TBA). We've been burned by detachables with questionable performance before, but get ready because Core M might make these things finally worth a damn. The 13.3-inch is due to hit stores on October 29th, starting at 1050, and the 15.5-incher on November 5th for $950.